Although Oregon’s weather is gently easing into fall, its political climate has been tumultuous for some time. Throughout this season, CAPACES Leadership Institute has remained a strong shelter for the communities we serve in the Willamette Valley. We continue to guide community leaders of our sister organizations so they might be better equipped to navigate and lead their organizations’ constituents through the issues that so deeply affect our community. And leaders who seek training at the Institute are thriving; their spirits are strong, and their hearts wear the confident “Así Se Puede” (This is how it’s done!) outlook. As fall unfolds its bold splendor of color, we are delighted to celebrate the initiative and accomplishments of CAPACES network member Fabiola Camacho. Her spirit to volunteer and to prosper her community reflect the core of the Institute’s mission: to prepare leaders with the political consciousness and skills needed to lead and support social justice work. CAPACES Leadership Institute offers a unique program to establish and equip leaders called Leadership Forum. Fabiola Camacho recently participated in Leadership Forum 2.0: Leadership for the Long Haul. She has a long history of volunteerism and service as a leader within the movement. 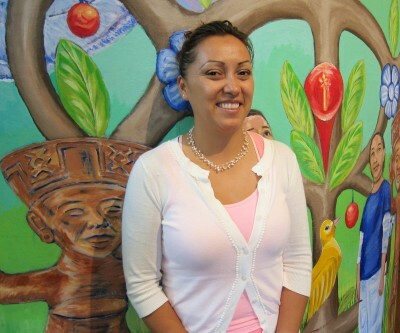 She currently works with our sister organization Farmworker Housing Development Corporation at Nuevo Amanecer in Woodburn, and volunteers her time serving their after school program. “I love to jump in head first in whenever there is an opportunity to learn. If I go to a class to learn, I know my mind will expand and I will be more knowledgeable. I am nourished and strengthened by both the people leading 2.0 and my compañeros attending it with me. The more that I reach out to them, the more I learn, and the more personal goals that I can accomplish. With groups like CAPACES, I’m not just going to get to my goals quicker, I’m going to have an even farther reach than I imagined. The 2.0 class gave me the opportunity to get to know my compañeros and to better understand them. Now when I arrive to class, I see them for who they really are; not as employees of an organization, but humans with the same emotions and struggles and desire to help our community and to fight injustice that I have. Now they’re my second family. We desperately need this companionship and solidarity. I vividly remember the first time I felt the desire to hug one of my compañeras – Before the 2.0 class we greeted each other out of formality. Now I know her story, and we are open to one another. Next time I see her I will greet her with a hug. I also see the movement leaders completely different now. I know I can call them with any need, and they will gladly help me. I can express, grow, trust, and be stronger because the leaders invited me to join them in the 2.0 class and share the strength and knowledge that I have. During our individual mentorship meetings, the leaders coach us, give us ideas and suggestions, and strengthen us. My mentor, Laura, helped me start studying accounting after years of wanting to but being too overwhelmed to get started. I learned that I have to do something for anything to happen, and that when I act, I have positive results. Thank you, Fabiola, for your hard work and service to our community!